Florida in March isn’t just about Disneyland and alligators: it also hosts one of the very biggest, toughest motorsport events in the world. 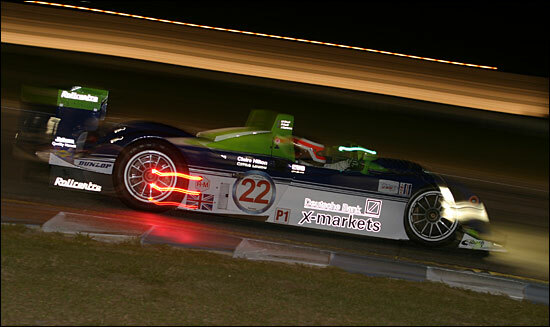 I know about the rather unique challenges of the 12 Hours of Sebring, having raced here last year with the DeWalt TVR team. The course is fast, the surface is punishing, unbelievably bumpy and the heat………… well, it turned the TVR into a blast furnace. A really, really tough event. This year though it’s entirely different. The car, for the first time in more years than I care to remember, is a purpose designed race car (rather than a car designed initially as a road car). While it is still hot out there (86 degrees on Thursday), an open car certainly has the edge on driver comfort. It’s difficult to explain just how impressive the Rollcentre Dallara Judd really is. The car is hugely quick in a straight line, it pulls like a train, and the four litre V10 Judd pumps out around 600 horsepower, which is more than enough to grab your attention as a driver. The carbon brakes too are tremendous and the downforce takes the whole package to a completely different level from a GT car: even at medium speeds you can genuinely feel the difference. As is often the case with a new car, there is a steep learning curve. It can be frustrating at times, with trial and error the order of the day as we work our way through the inevitable difficulties. The team though have been tremendous, and their work rate is unbelievable (the pit crew has so far managed a grand total of around 13 hours sleep in the past four days). Joao (Barbosa) has been doing the lion’s share of development laps: he has more experience of this sort of car than Martin or I and he can take us forward far more quickly. 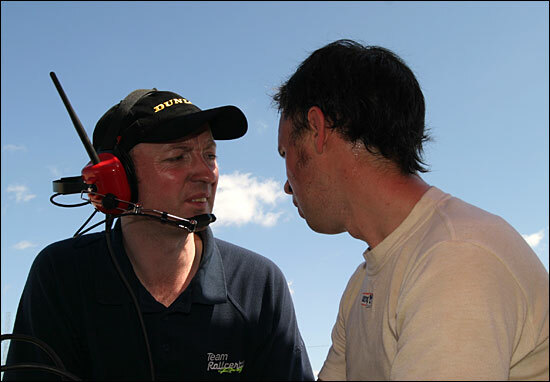 Martin too has had plenty of time in the car, learning the circuit and the car’s capabilities. I’ve had fairly limited time out in the car so far this week, but the laps I’ve done have been very encouraging. Within 10 laps I was down to a 1:53, just a second or so down on the time that Joao set in qualifying, for sixth place overall on the grid. While all-out speed is important, consistency in these races is the key, that’s what really sets a good sportscar team apart and that’s what we’re working on. Thursday evening was night practice: a big prototype like the Dallara, on a circuit like this, catches the little GT cars at a fantastic rate and traffic can be a big problem if you aren’t very wide awake indeed. I’m just glad to get more time in the car and more opportunity to get to grips with its potential. (Rob posted a string of very competitive times in the session, his first laps in a prototype in darkness). We’ve finally hit the jackpot with the set up, the car felt really good, much more friendly to drive than before, more compliant over the bumps. I had some trouble getting a clean lap in the night practice session and set lap times in the 1:57s and 1:58s: with better luck in traffic the car feels easily capable of a 1:52 or 1:53. We’ll see on Saturday! The race promises to be fantastic. The three Audi R8s are immensely capable with stellar driver line-ups. On our form so far however we could be in the hunt for best of the rest and if the Audis stumble! Who knows what might happen?